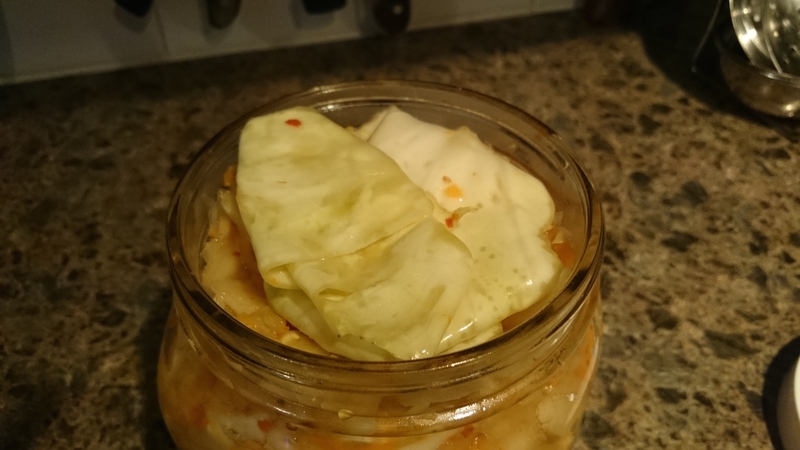 Sauerkraut is beyond easy to make, extremely valuable for healing your gut and it’s cheap to make! More strains of probiotic than the $50.00 per month probiotic you are getting from the health food store. Fermenting. How does it work? The process is called lacto-fermentation. On the surface of the cabbage there is beneficial bacteria present. Lactobacillus is one of the many bacteria’s found, it’s also present in yogurt as well as many other fermented food products. For the food safety questions: When the cabbage is submerged in brine the bacteria begins to convert the sugars to lactic acid, a natural preservative inhibiting the growth of harmful bacteria. small bowl that the Mason jar will sit into. Make sure your Mason jar and lid are washed and rinsed of all soap residue. Make sure your hands are really really clean. You’ll be using your hands to massage the salt into the cabbage. Discard any limp outer leaves of the cabbage. Keep the first two good leafs by pealing it off and placing it aside. Trim out the core and cut into quarters. Slice each quarter down its length, making 8 wedges. Slice each wedge crosswise into thin ribbons. Transfer the cut cabbage to a big mixing bowl and sprinkle the salt, ginger, garlic and hot peppers over top. Begin working the salt into the cabbage by massaging and squeezing the cabbage with your hands. At first, it may not seem like enough salt, but gradually; the cabbage will become watery and limp. This will take 10 minutes. Let your cabbage sit for an hour covered. Then massage again. Repeat if you don’t see juice at the bottom of the bowel. Put your Mason jar next to the bowl with the cabbage in it. Put handfuls of the cabbage into the Mason jar and pack it down tight. If you have a canning funnel, this will make the job easier. Pour in any liquid released by the cabbage while you were massaging it into the jar. The cabbage needs be covered with liquid. Get the outer leaf that you put aside and fold it till it fits into the mouth of the jar. Place over the surface of the sliced cabbage. This will help keep the cabbage submerged in its liquid. Cover the mouth of the mason jar with Mason jar lid. 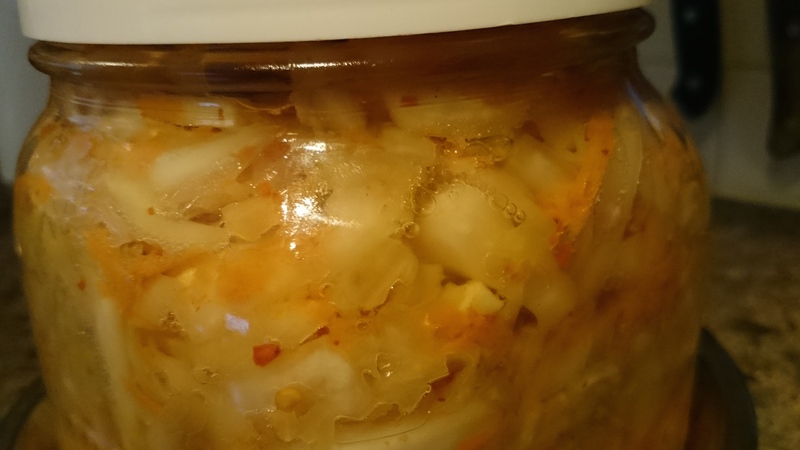 Keep a little loose as the fermentation process may kick some of the liquid out of the jar. If after 24 hours, the liquid has not risen above the cabbage, dissolve 1 teaspoon of salt in 1 cup of water and add enough to submerge the cabbage. Now that you have made your first jar of sparkling vegetables, start planning to go crazy by adding carrots, other vegetables, sea vegetables. The sky is the limit, have fun. 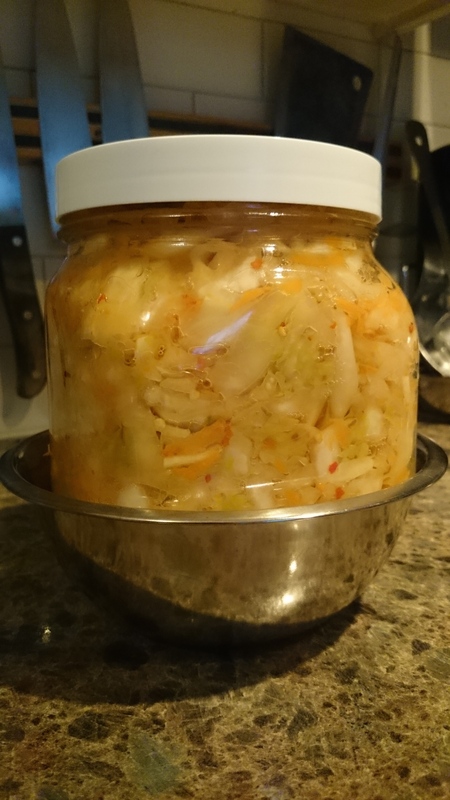 Because this is a small batch of sauerkraut, it will ferment more quickly than larger batches. Start tasting it after 3 days — when the sauerkraut tastes good to you. Throw away the folded up cabbage leaves and screw on the lid and refrigerate. There’s no hard and fast rule for when the sauerkraut is “done” — go by how it tastes. Let me know how you do with this wonderful health giving treat!